This is an interesting story for so many different reasons – I look forward to hearing your thoughts on the trade in walrus ivory through the Greenland colonies in a future post. Something that I hadn’t realized or thought about until these pieces started making headlines again was how the black and white pieces were distinguished form each other. Apparently, when they were discovered half of them were stained red. If it was ochre, someone must have scrubbed the bejeezus out of them to get them clean. Too bad. As for who should curate the pieces, I think the two sides should select national champions and play a head to head game with them to decide where they go. I think everyone would love to see those pieces used in an actual chess match. I hadn’t heard about the red (ochre?) stain on some of the chessmen. That’s a very cool detail. Perhaps some traces are left on the pieces? And I imagine the Hebrideans would love a shot at a deciding chess match–perhaps their only real chance of repatriation in the current climate. Other than mentioning the colour, it doesn’t say what it might have been, where it went or if any traces remain. I’d guess ochre and would be surprised if there wasn’t a trace left in some nook or cranny. Yes, ochre does seem like a good possibility. I wonder if an analysis of trace residues on the pieces would shed any light on their origin? I think the BM is in a cleft stick here. If they acknowledge the possibility that the chessmen were carved in the Hebrides, they’ll be called hypocrites for not giving them back. If they don’t mention it, they get this kind of coverage. What are their options? I agree that the BM is caught here between a rock and a hard place. But as much as I love gadding around its galleries and checking out stuff from all over the world, I’m beginning to think think these big national museums are dinosaurs, places where artifacts go to die, at least in one sense of word. I’d rather see the Lewis chessmen right where they were found, with locals telling me about them and what they mean to the community. And by the way, you and your colleagues have my sympathies about being on the receiving end of Hawass’s indignation. It’s paradoxical, in a way. Thousands more people have seen the chessmen at the British Museum than would ever have seen them in the Hebrides, partly because of the travelling distance and partly because of the myriad other objects that bring people into the BM. And of course that’s the only reason enough people know about them to underpin this kind of response to a call for repatriation. Contrariwise, there’s a little museum at a place called Gairloch on the West coast of Scotland which has a Pictish symbol stone, unlike a number of other places whose stones were hived off to the National Museum of Scotland in the last century, all with their own little repatriation debates. Getting to Gairloch is very difficult, a two-hour bus ride from the nearest rail station which is served four times a day each direction. It is unlikely that more than a few hundred living people have seen that stone and that number is never likely to increase much. So, who is the ‘community’ for these objects? 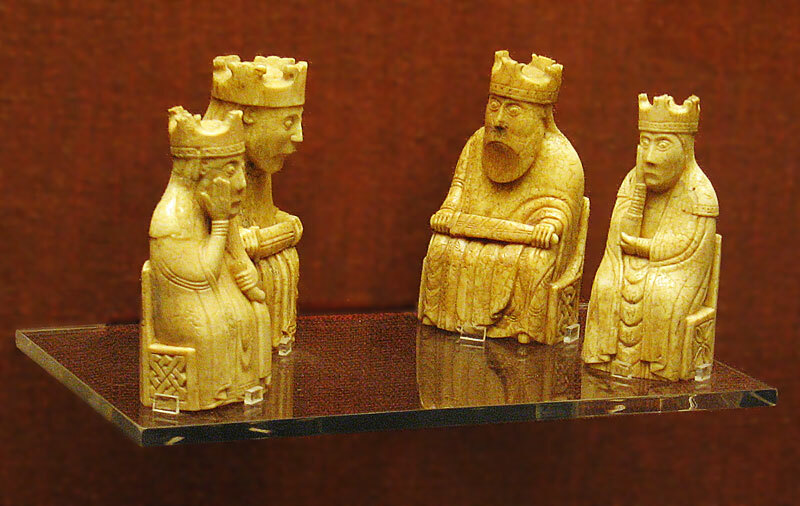 The Lewis chessmen are icons known the world over. Gairloch’s stone, barely even a source of local pride. How many people who feel some connection to the chessmen (quite possibly with as strong a genealogical basis…) wouldn’t ever have seen them if they hadn’t wound up where they have? Which of these objects has `gone to die’ and which is living the high life?